It is also performed once a year to keep the negative energies out of one’s home. 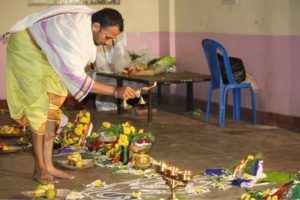 The Ayur-devatha is being invoked through Agni(The Sacred fire) and learned pandits/priests perform 40 different types of oblations to the fire, thereby invoking the Ayur-devatha to bless the elders, children and everyone present at home with a long lasting and fulfilling life. Translation: “Offering Oblations to that Adivaidya – the oldest doctor, doctor of doctors in the form of Dhanvantri to instil and bless Arogya (good health) to everyone”. 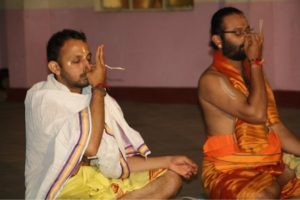 Who should perform Ayush Homa’s? 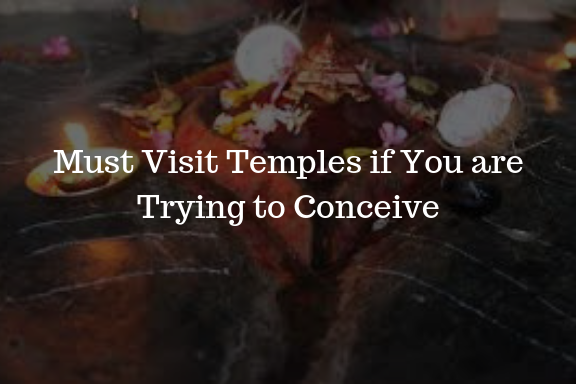 This Homam is performed by people who have new-borns in their homes. It is also performed by people who are not well, have been suffering from an ailment for a long time. anyone who is willing to ensure the longevity of elders and children at home and by most other people for overall well-being. People who want to ensure the longevity of elders and children at home and others who want to increase their overall well-being can also perform the homas. Blesses one with a long life. Grants Boon for a disease-free life. Relieves oneself from incurable diseases/ailments. 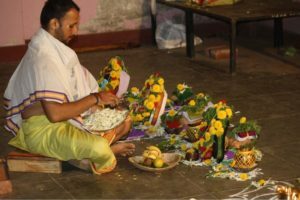 When is the best time to perform an Ayush homam? The best time to perform this Homa would be on the birth star of the person for whom the Homa is to be conducted. Also done on their date of births(if birth star unknown) to grant them full benefits of the Homa. a)Turmeric: used for indicating auspiciousness in the function. b)Kumkum: used for removing bad omen during the Homa. c)Coconut: used for absorbing any negativity in the surrounding, also used as an offering to the Sacred Fire. d)Ghee: used for offering/oblation to the Sacred Fire. e)Firewood: used for burning away all the negativity in and around our homes. f)Samithu: used for medicinal properties and also cleans the air. g)Cowdung dry: used in the Homa for purifying the air and also as an offering to the Sacred Fire. h)Avishu (cooked rice): used as an offering for the Sacred fire. j)Camphor: used to burn away all the entangling desires one has in his mind and body. Also to prevent bad omen. 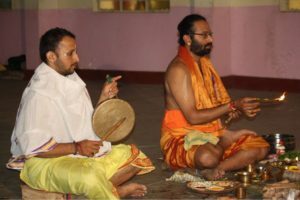 k)Poornahuthi : this is an offering which consists of a red satin cloth which is wrapped around some dry fruits, roots of certain herbs, turmeric, Kumkum and a Large sized Dry coconut). Each one of these ingredients have the capacity to destroy bad omens, increase the sanctity of the ritual, clear the environment from toxic elements and to finally eradicate all the evil that surrounds the environment, thereby increasing the benefits of the ritual immensely. This will also be the final offering/oblation that will be made to the Sacred Fire.